S2s region strongly overlaps Mo3d when sulfur is present as sulfate. Mo3d peaks are asymmetric for molybdenum metal. Peaks are symmetric for Mo oxides. Mo3d region has well separated spin-orbit components (Δ=3.15 eV). Multiple oxides observed (MoO, MoO2, MoO3). Argon sputtering reduces oxides to mixtures of lower oxidation state oxides and metal. Molybdenum, a silvery white, very hard, transition metal has one of the highest melting points of all pure elements. Until the eighteenth century, compounds of molybdenum were mistaken as other elements such as lead. 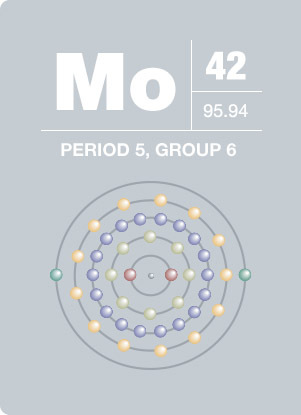 In fact, the element is named after the Greek molubdos, meaning “leadlike”. Molybdenum was rarely used until the turn of the twentieth century when a French company, Schneider and Co., discovered its beneficial alloy agent in armor plates. Today, a large percentage of all molybdenum is used in notably high strength alloys and high temperature steels for aircrafts and missiles. Molybdenum also serves as a catalyst in the petroleum industry, extracting organic sulfurs from petroleum products. Equally important, molybdenum is necessary in plant nutrition, and is found in certain enzymes such as xanthene oxidase.